User makes initial contact with the bot, which uses Messenger's built-in NLP functions to respond to general conversation. Automatically generated description for the New York Times article. User can send saved links to bot, making for ease of use with NewsFeed. User sends a link to an article, from which the bot gets key text and content from the page behind the scenes. Automatically generated description for the TechCrunch article using TextRank. It's fairly obvious that traditional news sources like newspapers (even online publications) and television are being replaced by news transmitted by peers and influencers on social media. This is statistically true--Pew Research says as a percentage of US adults, 45% of Americans get news on Facebook. This is also anecdotally evident: a quick scroll through your NewsFeed shows you links shared by peers, from the serious--shootings, accidents, politics, and natural disasters--to the lighthearted--think BuzzFeed articles. It's pretty clear that there's no shortage of textual information to be synthesized on Facebook. This can create an overwhelming overload of information for some Facebook users. 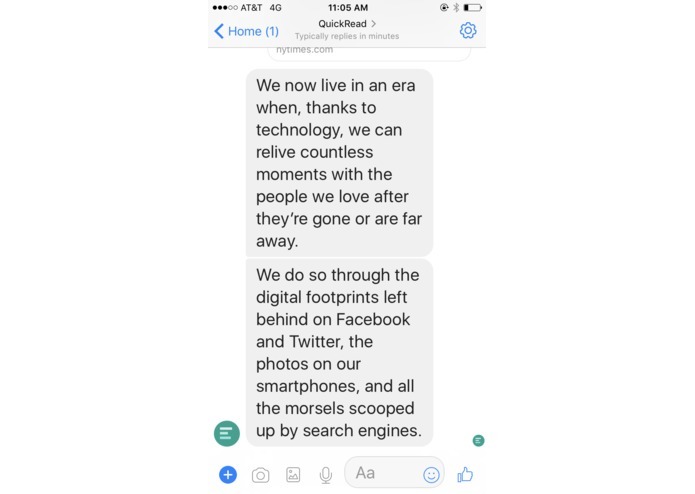 We wanted to find a way to make the experience of going on Facebook and using Facebook as a news source, as an increasing number of people are doing today, less cluttered and more personalized. 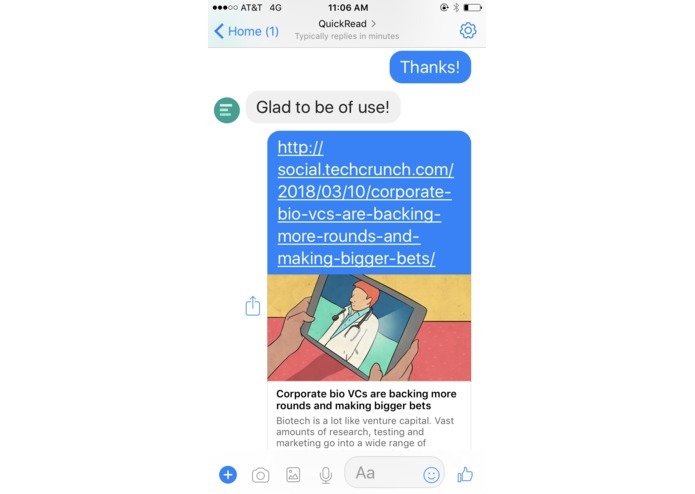 As social media becomes increasingly popular with the youth largely spending their time on instant messaging services, it was a nautral choice to place our project on the Facebook Messenger platform. This platform places our product in the hands of millions and allows us to better integrate with the news feeds that our users read. 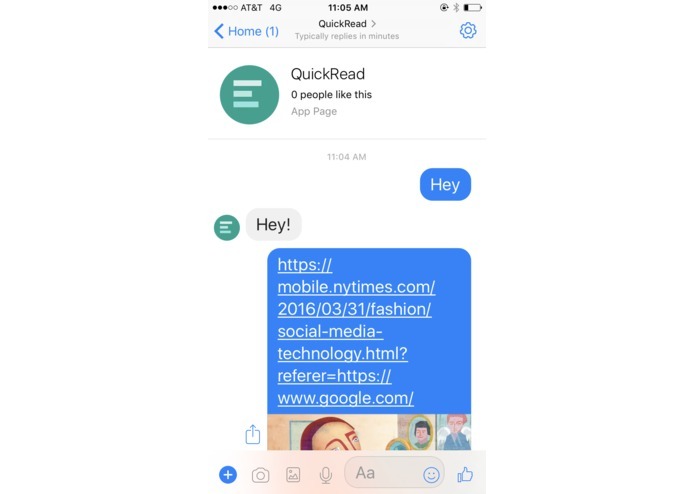 Instead of scrolling through minefields of ads, QuickRead takes a link to any news story or article on the internet, and returns within a personalized Messenger chat for the user a brief, generated summary which represents the contents of the article. This summary is generated with the TextRank algorithm, and our tests with a variety of articles have shown strong results. Please visit our github page to get started. The API documentation for Messenger was very sparse, requiring lots of low level debugging. We had to explore each JSON object manually to find hidden functionality not disclosed by the documentation. 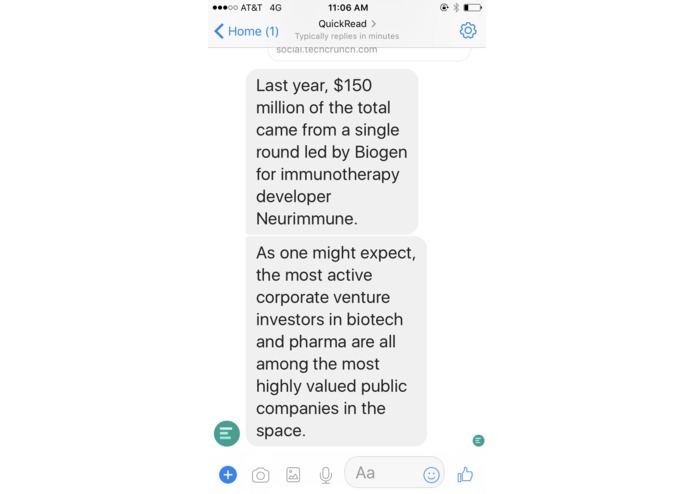 We had multiple false leads, not realizing that Messenger did not support text based interactions in group chats, requiring us to take the 1 on 1 bot approach. Submission to Facebook for approval and publication to the wider Facebook community rather than only approved testers and developers currently granted access. Develop a chat extension to allow the chat bot to be used within group chats. This is specifically helpful for research groups sharing news articles that they found helpful. Customization options allow for users to better customize the level of detail they would like in the summaries and how long each summary should be. 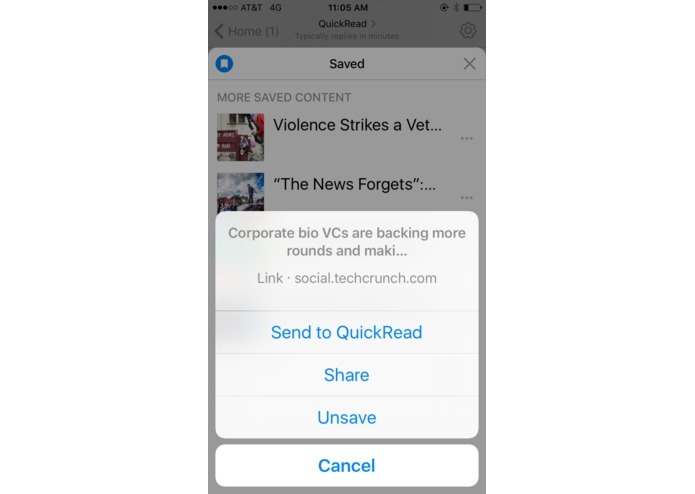 Suggested articles list will allow users to skip scrolling the newsfeed entirely, removing the problems where pressing the back button one too many times resets the newsfeed back to the top and forcing the user to scroll all the way back down.